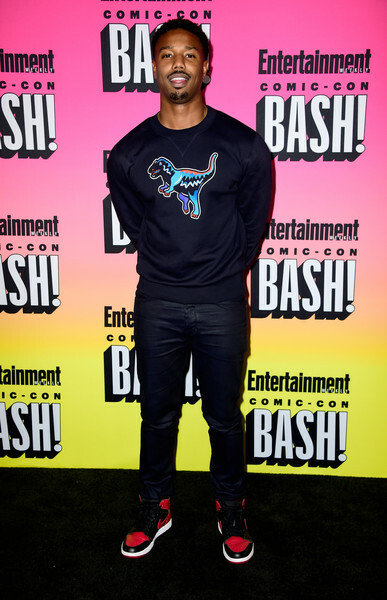 More Comic-Con fashion from the panels, parties and photocalls with an array of style choices from casual cool to high end chic. 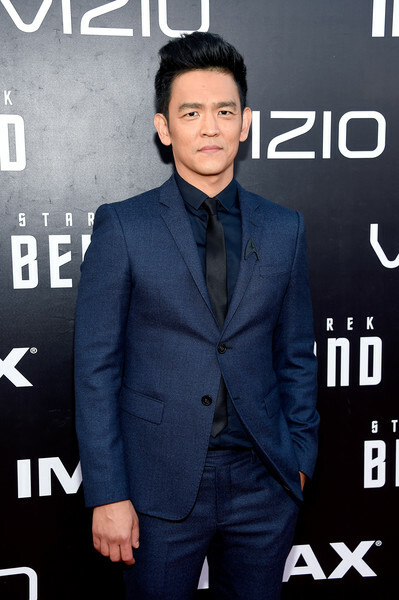 Yesterday we covered the annual Entertainment Weekly party and the Hannibal panel; now we’re rounding up the best of the rest from the over weekend. 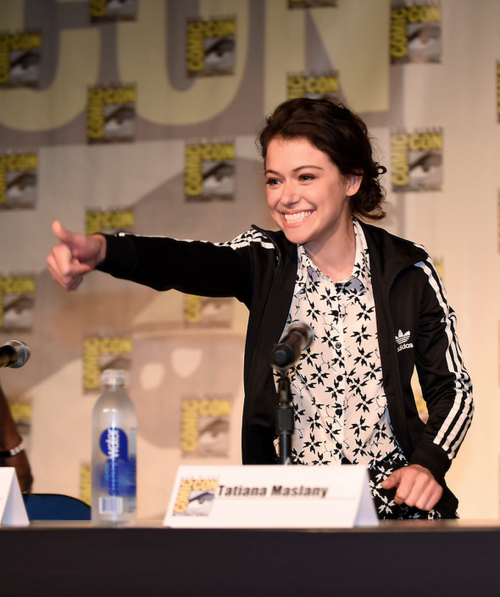 Pairing Tanya Taylor with Adidas is such a fantastic move from Tatiana Maslany and the three stripes classic jacket is giving me a strong hint of 90s Britpop nostalgia. This might be why this is my absolute favorite outfit from this year’s Comic-Con. So simple and yet so effective. 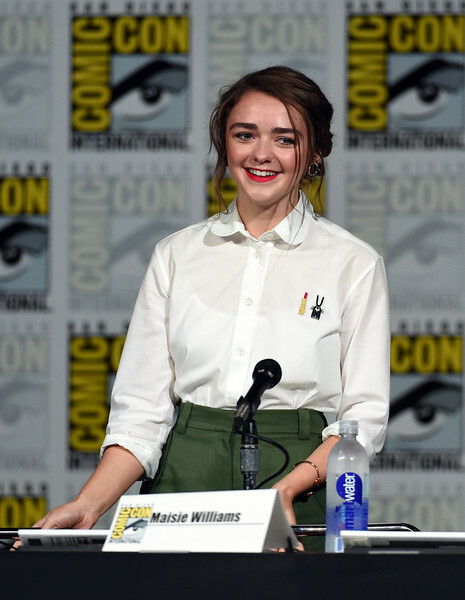 A really good style weekend for Maisie Williams and at the TV Guide Fan Favorites panel she wore a super cute white blouse paired with green shorts. Now to find out where the blouse is from as the lipstick and bunny motif is adorable. 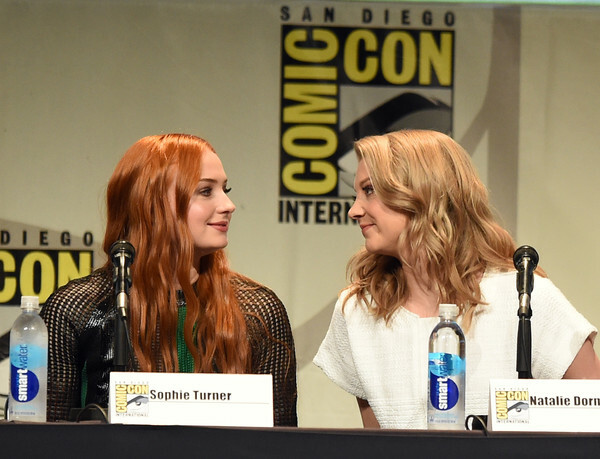 Quickly followed by longingly gazing into each other’s eyes. 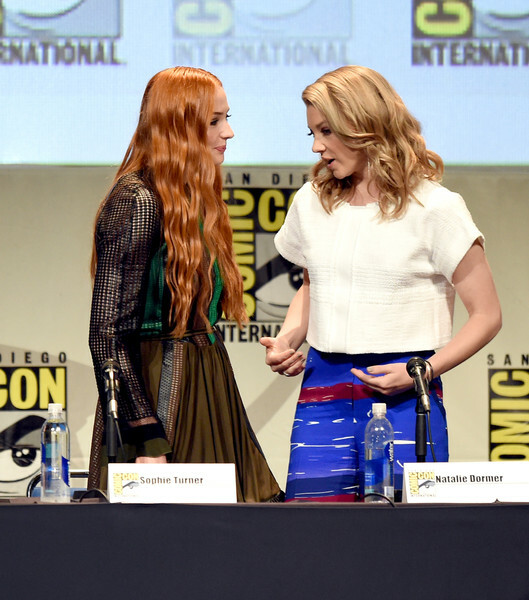 The GoT cast were hot on double panel duty (Maisie Williams for Fan Favorites, Sophie Turner with X-Men and Gwendoline Christie at Star Wars) and Natalie Dormer switched out patterned pants for a stunning Mary Katrantzou dress, which looks really great as she strides across the stage at the Screen Gems panel. The Scream Queens cast were out in full effect and it only just occurred to me that I have only ever made it to the end of one season of a Ryan Murphy show – American Horror Story: Coven for some reason got me to stick it out and I can’t figure out why – and from the preview this *could* be one that sticks. Or it could be like all the others where I quit a few episodes from the end. At the panel Keke Palmer cozied up to Skyler Samuels and the orange lace and navy blazer perfectly complement each other. At the photocall Samuels wore a patterned (covered with florals, lightning bolts and hearts) wrap dress for a perfect summer frock vibe. While this doesn’t have the same sartorial flare as some of her previous outfits I still really love this shot of Gwendoline Christie posing with her Star Wars co-stars Domhnall Gleeson (excellent belt and beard combo) and Adam Driver. A battle armor mini for Kate Mara in Valentino. What looks like an excellent homage to the 20th anniversary of Clueless with multicolor plaid for Willow Shields at the panel for The Hunger Games: Mockingjay – Part 2. A fun spin on the LBD from January Jones at the Fox party in a CG frock with red lipstick and curls to make the outfit pop. Plus all important pocket posing utilizing. I’m pretty sure only Ashley Madekwe and Diane Kruger could really pull off this Self-Portrait asymmetrical crop top with matching culottes; such a fun graphic print and Madekwe has an excellent sartorial eye. The future of Hannibal still hangs in the balance (sadly both Amazon and Netflix have passed) and at the Hannibal Pannibal on Saturday at Comic-Con Bryan Fuller said they are still exploring options including the possibility of a feature. There is still plenty of Hannibal left to enjoy and it looks like this week’s episode will be wrapping up the Hannibal on the run storyline. A time jump of three years will take us into the Red Dragon arc and a five minute preview reveals a whole lot more of Richard Armitage as Francis Dolarhyde (the blurring button is getting a workout this season). Armitage was introduced to the world of flower crowns and Fannibals at the panel this weekend. Armitage appears far less terrifying here than he does as Dolarhyde and it really looks like he has captured the terrifying physicality of this character that in the past has been played by Ralph Fiennes and Tom Noonan. There are two sides to Dolarhyde and if this preview is anything to go by Armitage nails both. If you are unfamiliar with the Red Dragon arc and don’t want to know what fate awaits Hannibal then maybe wait to watch this clip until after this Thursday’s episode, but I definitely clapped my hands with glee at new haircuts, visual flourishes, red suits (because of course) and different living arrangements. This is the one Thomas Harris book I have read and I’m looking forward to seeing how Bryan Fuller is going to put his spin on the material (especially when he has used some of it for the Freddie fakeout last season). 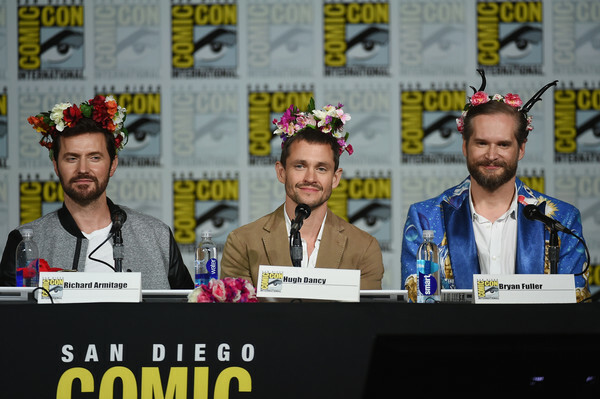 Watch the super fun panel below includinb Bryan Fuller revealing how Comic-Con played a big part in the “spitters are quitters” line from a couple of weeks ago, how short shorts are coming and Hugh Dancy reminding Fuller of which Red Dragon lines they have already used. Also Fannibals have such good costumes and questions. Going away the weekend Comic-Con is on means I have a lot of catching up to do this morning as this annual event continues to attract stars from a whole host of TV shows and movies, which means plenty of outfits to scroll through. 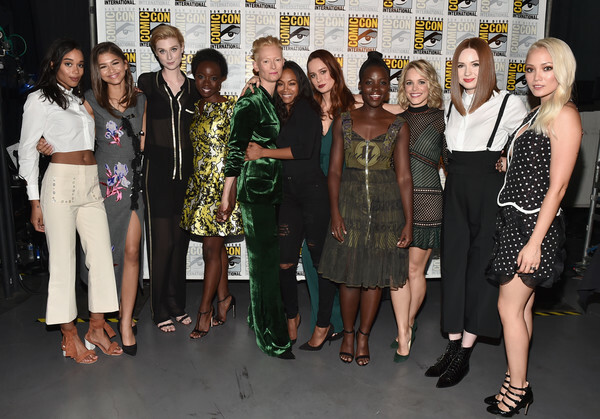 Let’s ease into the week with the Entertainment Weekly shindig and as tends to be the way at Comic-Con there are different degrees of dressed up; this variety of styling makes this a fun rundown as there’s everything from 50s style prom to funky summer dresses. The texture of Maisie Williams’ dress suggests something from the ocean which ties in nicely with her oyster girl cover story from Game of Thrones as well as her recent conservation work. Ashley Madekwe could travel back to the Studio 54 heyday and blend right in wearing this amazing Saint Laurent gold dress. As you can see from this party gold is on trend at the moment with Katie Cassidy working a glitzy floral pattern mini. Going for a slightly dressier look is Lily James in shimmery Altuzarra and she continues her fashion hot streak after a very strong Cinderella promo tour. 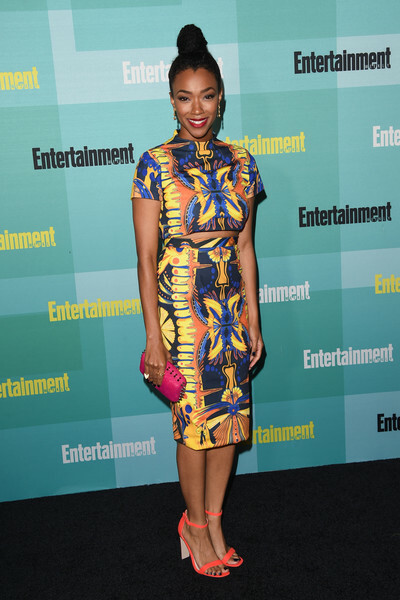 The Walking Dead’s Sonequa Martin-Green is a bold pattern queen in this kaleidoscope print frock. Now this is a group I would want to hang out with at this party and Sarah Paulson’s Suno dress is rather understated for her and looks great. 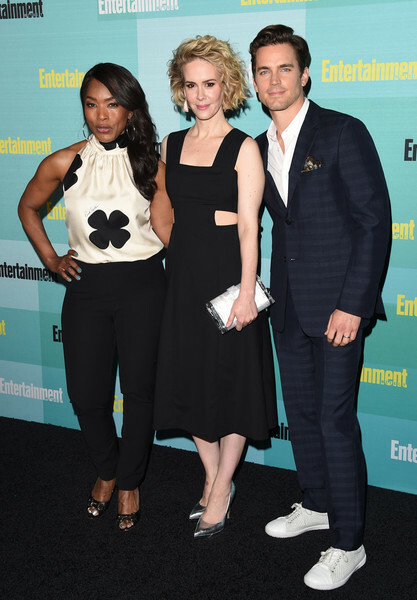 Angela Bassett continues to look the best in anything and Matt Bomer’s suit is far more interesting than all of his very safe Magic Mike XXL promo tour attire. 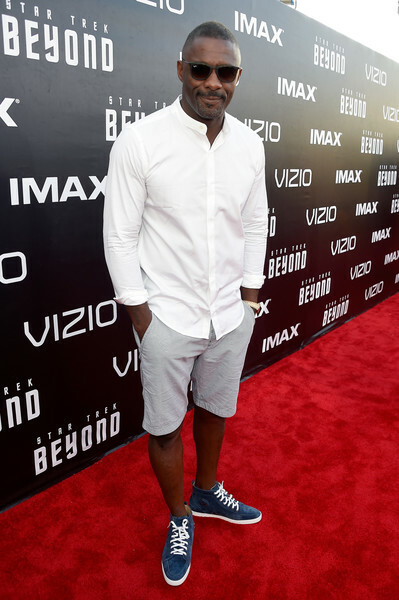 Not quite sure how I feel about the super white sneakers as they instantly distract from everything else. 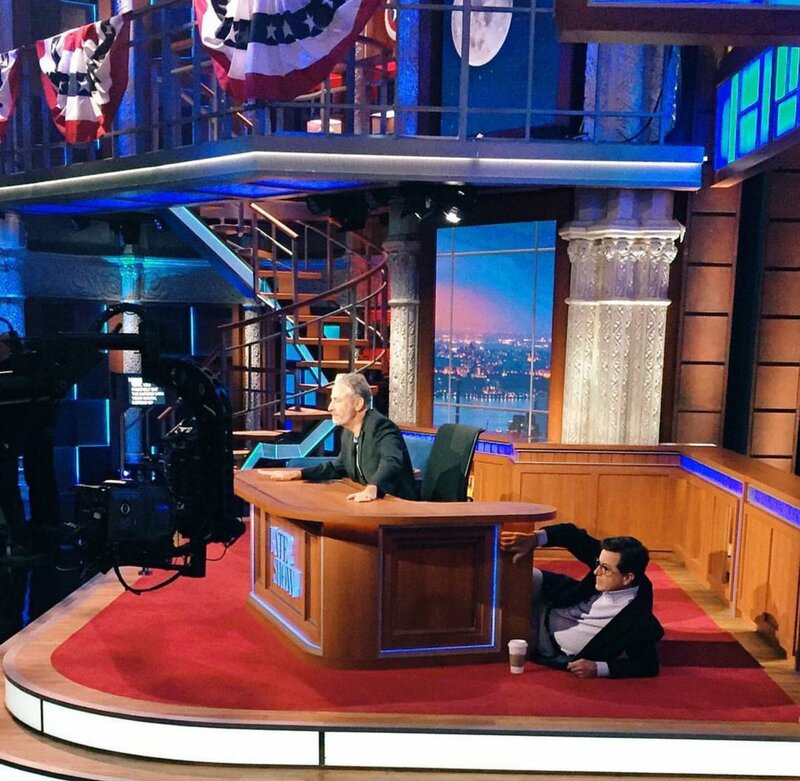 But it also a relaxed affair so they also kinda make sense. A very cute purple frock from The Flash’s Danielle Panabaker and I love her messy fishtail braid to boot. Fun summer florals from Candice Accola with her hot pink lipstick serving up an excellent extra pop of color. Camren Bicondova from Gotham is wearing the skirt version of the Alice + Olivia dress that Aya Cash wore a couple of months ago and it looks just as great here especially when paired with a plain black tee. Carice van Houten’s skirt looks like really fancy silk wrapping paper, but the simple blue blouse balances this look out and once again she is wearing killer lipstick. This is very much 50s fancy from Jennifer Morrison and while it is maybe a tad dressy for this event it is still rather fun. And maybe she is cosplaying Betty Draper or Libby Masters. Peggy Carter is moving to Hollywood for season 2 of Agent Carter and she is taking some of her co-workers with her. So far it has been confirmed that James D’Arcy (Edwin Jarvis) and Enver Gjokaj (Agent Daniel Sousa) will be back with Lyndsy Fonseca, Bridget Regan and Chad Michael Murray in talks to return. 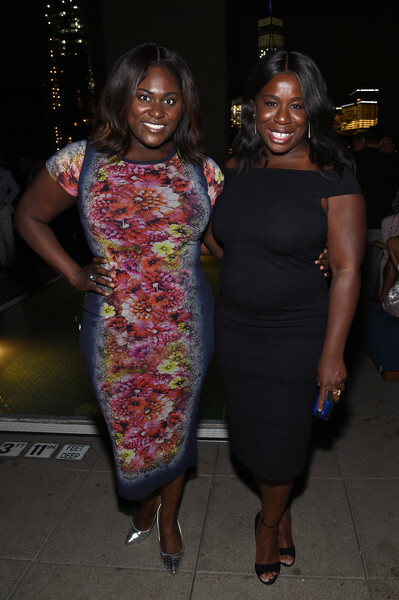 It would make a lot of sense if Fonseca’s Angie headed out west with Peggy considering her acting dreams and this is one lady friendship I would like to see a lot more of. Regan makes an excellent foil and her ties to the overall MCU backstory as part of the Black Widow Program make her inclusion seem all the more likely. A second season was not always a sure thing as it sadly Agent Carter is far from a ratings hit and so it already feels like a victory of sorts that we’re getting more Peggy Carter. The cast will appear at Comic-Con next Friday (July 10) and this poster will be available at the Marvel booth (#2329) from Thursday. 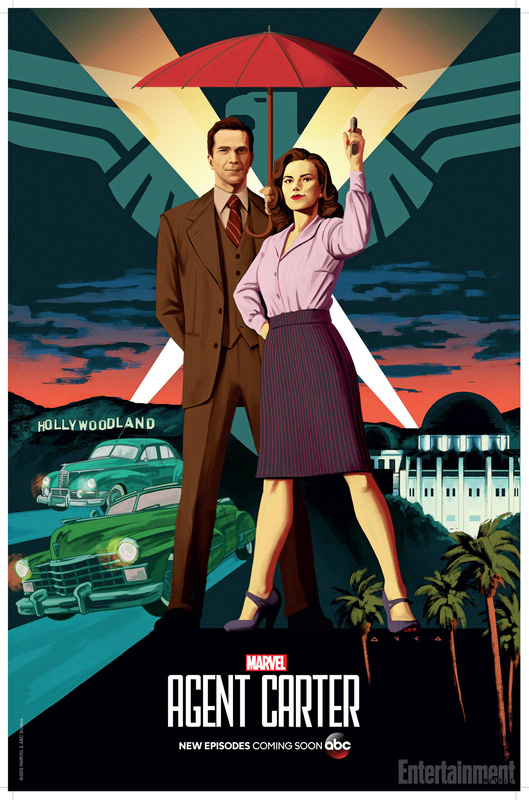 The limited edition Comic-Con poster was unveiled by Entertainment Weekly showing off the new location complete with the old Hollywoodland sign and Jarvis in tow. Look out for more coverage of Agent Carter from Comic-Con and Hayley Atwell really wants to get back to work.